• November 8, 2014: A sociological study showed that as many as 57% of students in first and fourth ESO (Obligatory Secondary Education in Spain) do not want Jewish people to be their classmates. The research conducted by Xavier Torrens, a sociologist professor in the University of Barcelona (UB), confirmed an evidence: thousands of Spanish teenagers still hold prejudice attitudes towards the Jewish community. According to the study, anti-Semitism is the third more present prejudice in the Spanish society, after prejudice towards gypsies and xenophobia.“When people think about a Jew, the majority see an aggressive serviceman or an ultra-orthodox and dangerous person”, Xavier Torrens said. In order to achieve a more equidistant relationship between the reality and the perception of the Jewish community, “society has to break those stereotypes and rumours down”, he added. • November 7, 2014: Twenty gypsies held a demonstration in front of the Real Academia Española (RAE) head office (the main linguistic institution in Spain) to protest against the entry related to gypsies in the new edition of the Spanish dictionary. One of the meanings provided defines a gipsy as “someone that tries to deceive a person in a certain situation with shrewdness, falsehood and lies”. Protesters asked to change this definition because they believe it has racist connotations. “The RAE humiliates us and hurts every single gipsy. ¿What will happen if a child read in the dictionary that his gipsy classmate is not trustworthy? RAE is racist and foments racism”, people demonstrating said to the press. “Gypsi” entry in the RAE Spanish online dictionary. The fourth definition says: “a person who cheats and acts dishonestly”. • August 9, 2014 (Ferguson): Michael Brown, an unarmed black teenager, was shot and killed by Darren Wilson, a white police officer, in Ferguson, a St. Louis suburb. The police version and the witness’s one differ at some crucial points, so the death circumstances are in dispute. Both sides seem to agree in the fact that there was a struggle in the police patrol car, before the officer fired Michael Brown inside the vehicle. However, Darren Wilson claims that he had no option but to fire him, after a dispute for his weapon, while other witnesses (including the friend with whom Michael Brown was walking down the street – Dorian Johnson- before being stopped by the police) said that the teenager was trying to escape from the officer’s grasp. After the first shooting accounts differ. According to some witnesses Michael Brown ran away and the police officer went out of the car and shot him, even though the teenager had his hands up. Ferguson Police have denied this statement and insisted that no sooner had Michael Brown moved towards the officer in a treating manner than Darren Wilson fired him. A private autopsy conducted for the Brown family showed that the teenager had been shot at least six times, twice in the head. The autopsy conducted by a military doctor as part of an investigation by the Justice Department also found that Brown was shot six times. Apparently the police officer approached Brown and his friend because they were “walking down the middle of the street and blocking traffic”. However, six days after the shooting, the police revealed a store surveillance video where Brown appeared to be the “primary suspect” in a strong-arm robbery at a grocery, where he allegedly stole a box of Swisher Sweets cigars worth $48.99, before encountering police. The unclear circumstances of Michael Brown’s killing fuelled protests in Ferguson and arose once again the racism debate in the town, where 63% of the populations is black-skinned, but its leadership and its police force are predominantly White. As these pieces of news illustrate, ethnic prejudice has not become extinct. Since the ONU approval of the International Bill of Human Rights, after the II World War and Jews Genocide, racism has turned out to be undesirable. However, does it mean that we have eradicated it? Nowadays it exists a rejection of an explicit manifestation of racism. Nevertheless, there are many experts who are convinced that the old or traditional form of racism is still in the society but with a new face, a modern one. Hence, we could say that we are not facing an extinction of racial discourse, but an evolution to a new form of racism subtler and less evident. 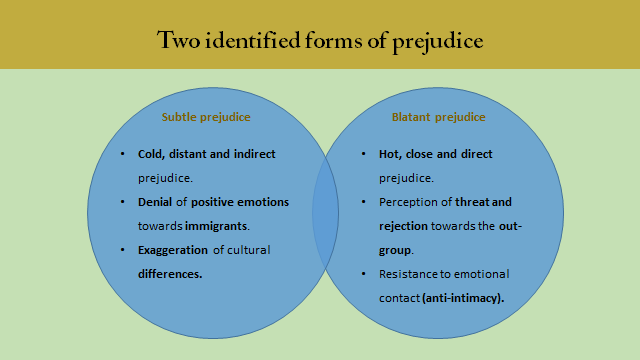 Forms of prejudice according to Pettigrew & Meertens, 1995. 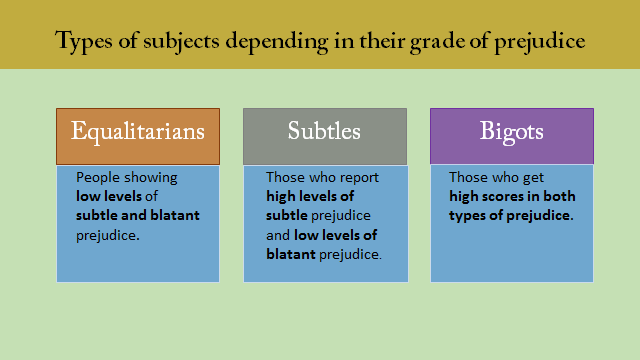 Types of subjects depending in their grade of prejudice. Pettigrew & Meertens, 1995. Racial prejudice was defined by Allport, an American psychologist, as “an antipathy based upon a faulty and inflexible generalization”. Prejudice may be felt or expressed and may be directed towards a group as a whole, or towards an individual because he [or she] is a member of that group. Prejudice is an attitude that results from a combination of three different factors: feelings, inclinations to act and beliefs. That combination is known as the ABC of attitudes: affect, behaviour tendency and cognition. In other words: if you dislike Moroccans, you will discriminate them and you will believe they are dangerous and ignorant (a negative stereotype). Stereotypes do not necessary implicate negative attitudes towards a group and sometimes they are useful so as to simplify the world complexity. Generalizations are quite common in every society. Many people, for instance, may share the idea that Spanish people are lazy, British people are punctual, etc. However, that does not mean that every single Spanish person is lazy or every single British punctual. The problem with stereotypes arises when they are negative, unfounded and overgeneralized and thus they turn into prejudices and they make us judge people before even knowing them, just because they are part of a categorized group. In 1998, the British broadcaster Channel 4 launched The Tourist trap, a reality show which aim was to see whether national stereotypes were completely unfounded or were partially true. In this kind of large-scale experiment, four nationalities (Japanese, British, German and American) were invited to spent time together at a Turkish hotel and then were secretly filmed, while the producers made them pass through difficult experiences: staff burning national flags, stealing things of their bedrooms, etc., so as to see how people from different nationalities react. It is difficult to find the original programme. The only video available is that in which the “experiment” is explained. To show to which extent stereotypes are unfounded and to make white people feel as being part of a minority (as black people are treated in United States) Jane Elliot, an American schoolteacher, created the famous “blue-eyed/brown-eyed” exercise. This was conducted the day following Martin Luther King Jr.’s assassination and was first done with third-grade school children in the 1960s. In this two-day exercise children were told the first day that people with blue eyes were superior to those with brown eyes. Elliot provided brown fabric collars and asked the blue-eyed students to wrap them around the necks of their brown-eyed peers so as to recognize them from the distance as a minority group. Blue-eyed children were given exta-privileges, such as five extra minutes at recess. 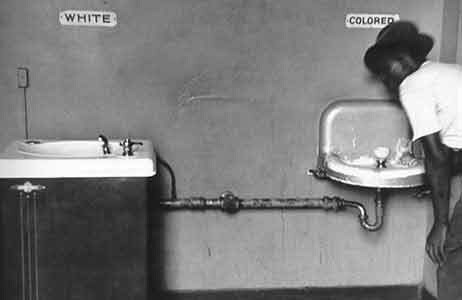 To emphasize the idea both groups of students could not drink from the same water fountain and neither play with each other. 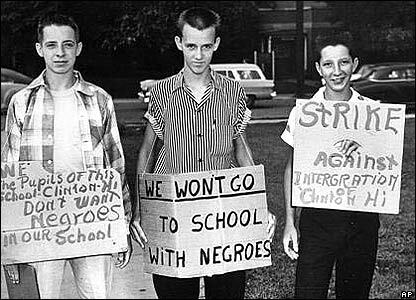 Despite an initial resistance to believe this statement, it took little time for blue-eyed children to become arrogant and unpleasant to their “inferior” classmates. On the other hand, brown-eyed people became more shy and struggled with scholar exercises that had been essay before, because of their lack of self-esteem. Part of an American television episode, “A class Divided”, that reconducts Elliot’s exercice. To see the full episode click here. Thanks to the exercise children became aware that the colour of someone eyes or skin does not make any difference in the kind of person he/she is. In other words: they learned to not to judge a book by its cover. Oprah Winfrey reproduces Jane Elliot’s experiment with her audience. It has been 45 years since Jane Elliot’s conducted her first exercise, but racism, as we have said, is still a present cohabitant. In 1940’s Kennet Clark and Mamie Clark proved that many people (white and black skinned) held anti-Black prejudices. In an experiment they asked children to choose between two dolls: one white-skinned and the other black-skinned. As you can imagine, the majority of the participants chose the white doll (even those children who were black-skinned! ), because they considered it more beautiful. In later studies children were increasingly likely to prefer black dolls, but the truth is that even nowadays there is a tendency to prefer white ones. Kiri Davis, a High Shcool student, explores the self-image of black children in the US by repeating the historic “doll test” of Dr. Kenneth Clark that led to school desegregation. Racial bias tends to be unconscious and unintended. To demonstrate this statement, in separate experiments, Joshua Correl and his co-workers and also Anthony Greenwald invited people to press a button quickly to “shoot” or “not shoot” men who appeared on screen holding either a gun or a harmless object, such as a flashlight. 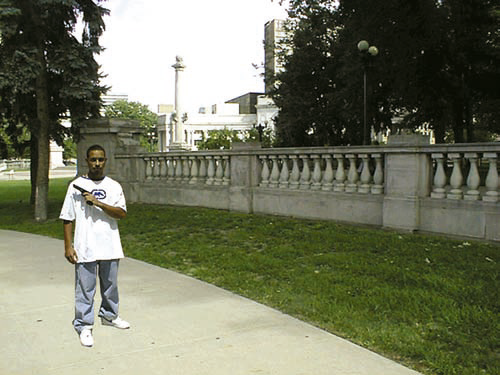 The results showed that participants (black-skinned as well) mistakenly shot more often black men who held inoffensive objects than white men. Prejudices do not only bias perception, but also (and more worryingly) reaction. Source: “Social Psychology”, David G. Myers (2010). In conjunction with these experiment and in relation to Michael Brown’s death in Ferguson, the New York Times created a graphic to show the number of black people searched in traffic stops and arrested by the police in this town, in comparison with white people. As you can see, African Americans are eight or nine times more likely to be arrested or stopped than whites. Is that because they are worst drivers or because they represent the 63% of the population in that town? Nothing seems to prove so. In fact, in other cities of United States, with less African Americans, percentages are nearly the same, despite black people representing the minority of the drivers on highways. Social: social conditions breed prejudices and the society maintain them. Motivational: our feelings and emotions can increase the development of prejudices. Cognitive: how we think the world and we simplify it influence our stereotypes and prejudices. Beyond the causes of prejudice, it is important to examine its consequences. According to David G. Myers, stereotypes can be self-perpetuating—their existence can prevent their change. Moreover, stereotypes can also create their own reality through self-fulfilling prophecies and, despite being initially untrue, their existence can make them become true. Besides, negative prejudices can also undermine people’s performance and affect how we perceive people and interpret events. Are there any possibilities to reduce prejudices? Psychologists are anticipating mechanisms to alleviate them. However, this is not a simple task because, as we have seen, they imply many sources (social, motivational and cognitive). The only thing we can do is fighting against all the items causing prejudice: if out-groups seem homogenous then we have to make an effort to personalize their members, if institutions perpetuate racism we can fight for an interracial school system, media system, etc. There is not a single and easy solution, but we should bear in mind that stereotypes, prejudices and discrimination spread more easily in crisis times, when frustration is a common issue. And guess what… We are confronting now one of the largest crisis in the past few decades! Coenders, M., Scheepers, P., Sniderman, P. M., & Verberk, G. (2001). Blatant and subtle prejudice : dimensions , determinants , and consequences ; some comments on Pettigrew and Meertens. European Journal of Social Psychology, 31, 281-297. 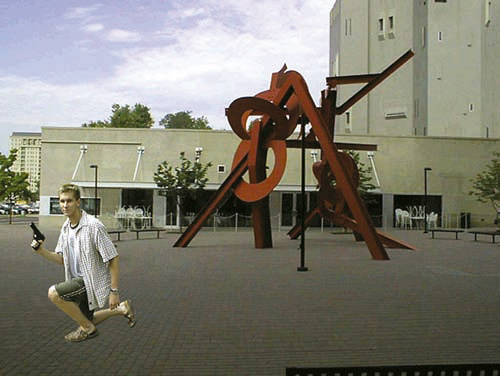 Espelt, E., Javaloy, F., & Cornejo, M. (2006). Las escalas de prejuicio manifiesto y sutil : ¿una o dos dimensiones ? Anales de psicología, 22, 81–88. Morales-Aguilar, J. E. (2011). Prejuicios, estereotipos y discriminación. Network de Psicología Organizacional. México: Asosiación Oaxaqueña de Psicología A.C.
Myers, David G (2010). Social Psychology. New York, McGrawHill. Pettigrew, T. F. & Meertens, R. W. (1995), Subtle and blatant prejudice in western Europe. European Journal of Social Psychology, 25, 57–75. Rueda F. J & Navas M. (1996). Hacia una evolución de las nuevas formas de prejuicio racial: las actitudes sutiles del racismo. Revista de Psicología Social, 11 (2), 131-149. This entry was posted in Sin categoría and tagged Discrimination, Doll test, Jane Elliot, Michael Brown, Pettigrew & Mertens, Prejudice, Racism, Stereotypes by Marina Force-Castells. Bookmark the permalink.